Few people know how bail bonds work until they become involved in the bail process. Here, we attempt to provide a simple, straightforward explanation so you know what to look for and to expect. We even produced a short video that explains the general features of the process and you can watch it by clicking on the image to the right. The cost of a bail bond varies based on the rules and laws of different jurisdictions. Find out more information, including the cost in your state. If you have questions about bail bonds, you more than likely aren't the first one. We answer some of the most common ones with this FAQs page. Are you able to negotiate the price of a bail bond when you work with a bail agent? Find out here. If you don't have the cash on hand to bail someone out, your next best option may be putting up collateral. 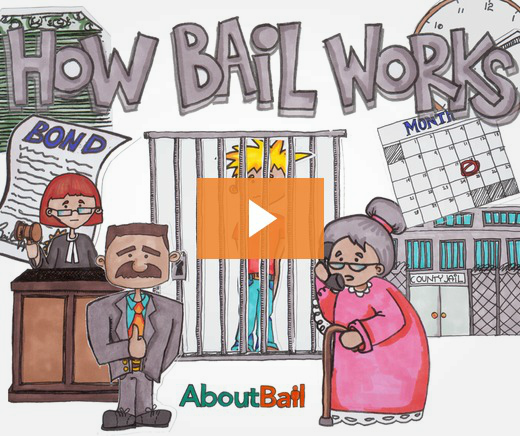 Learn what bail collateral is here. This quick guide will give you a better idea of whether you can expect to have your bail money returned. If you need to get an immigration bond to have your loved one or friend released from custody, here's what you should know. Fugitive recovery agents (also known as bounty hunters) locate and retrieve fugitives who have fled to avoid court appearances. Learn more about them here. If you or someone you know has been arrested and charged with an offense, a criminal defense attorney can be your best ally. Learn more about criminal defense here. If you're a bail agent, you can check out our bail calculator or head over to our CollateralMag for industry news and more.